Today Yu and team released a second update for the month of December. While it does not really contain new information of note, it does have a special treat for backers in the form of an animated Shenmue-themed greeting for the holiday season. Full animated version contained later in the post! But first, looking at the update text, there is confirmation that the LA Dinner reward took place in San Francisco earlier in the month (on December 11th), and this wraps up the last of the Kickstarter dinner rewards. I had been thinking they might be going to show some photos of the dinner event in today's update, but they didn't. However there are photos from the event that have been shared by some of the attendees, which I'll put up in a future post. The text also included an apology for any difficulty experienced in accessing the official site in the days following the recent announcement of addition of the PC version to the Slacker Backer campaign and the resulting increase in website visitors. In fact, Sega fansite Segalization investigated the slowness issue at the time and concluded that the site could do with optimizing to better deal with heavy traffic. They then passed this feedback on to the Shenmue team, and improvements to the site were put in place soon afterwards. This kind of cooperation on both sides is great to see. for their combined efforts in resolving the issue! The addition of the PC version to the Slacker Backer, together with the renewed exposure in the media, has made for a significant bump to the amount pledged to the project: in the week following the announcement in the previous update, an total of $16,070 has been pledged across 313 new backers. Of course, we know that Yu's main objective in providing Slacker Backer was to give access to rewards for people who weren't able to do so during the main campaign, rather than to try to maximize the amount collected. But it's still a nice increase. The update states that "we have now entered the final phases of R&D", which gives extra clarification to Yu's description of the project status from a recent interview in the Japanese Famitsu magazine that were mis-reported by some elements of the media. Finally the text ends with an indication that we will be able to see even more of the world of Shenmue III, and in greater depth, in the coming year. I'm looking forward to a video or trailer, myself! Below is the humorous snowy scene in its full animated glory. "Snowman Chai" sits at the left, with Ryo facing him in a winter coat and causing his head to fly up as he drives the handle of his spade into the icy ground. 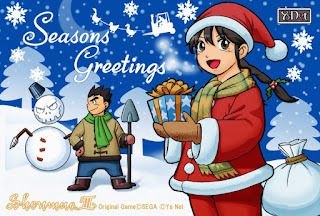 Shenhua is dressed in a Santa outfit and holds a wrapped present in her gloved hands, with her Santa sack of goodies sitting on the snow beside her. Seasonal detail: Shenhua's hair bands are in the shape of holly. In the sky the outline of Ryo can be seen driving a forklift, being pulled through the air by a team of ducks. This is a nod to the same element in last year's illustration (where he was "driving" the opposite way). The character of Shenhua also has changed from the early in-game model to an anime-style look, matching the rest of the illustration. This may be partly because the character faces are still being worked on, and it is one of the points that seems to bring an outpouring of feedback fans whenever shown! It can also be seen that the Shenmue III logo has changed from the new version using a simple font, to one that matches the style of the first two games. (Yu stated in a video interview earlier this year that he was considering using the simpler style for improved readability). I'm happy to see the return of the original logo here, and I'm hopeful it will be retained - it's atmospheric and suits the series perfectly. The inclusion of Chai in the picture is interesting. He has shown up in the Halloween update illustration as well as this month's game screenshots. Will he have a greater role in the third game than might have been thought? I like the way his "stick" hands have been bandaged, even though he is a snowman. So what is in the wrapped box Shenhua is holding, and her Santa sack? I'm going to guess that the sack holds a bunch of backer rewards, and the present is the newly-burned disk of the trial version of Shenmue III, ready for some early testing! 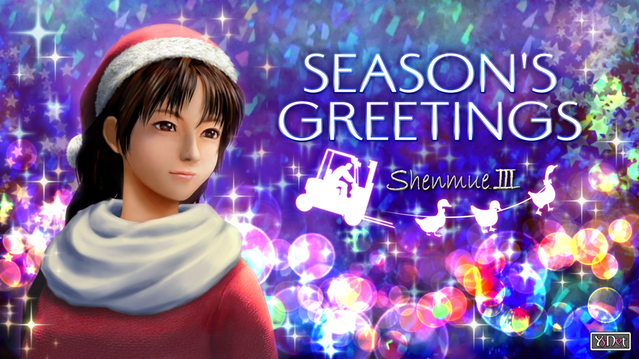 In any case, there is no doubt that we Shenmue fans are in for an exciting 2017! Excellent update, again. Feel free to pinch my Snowman theory posted on the Dojo and do some more digging! Hey VanJoelSan, thanks for your note. Yes, it is a fresh interview and an English translation is already in progress. Should be up on the blog today, so make sure to call back a bit later!